If adding pecans, sprinkle them over the top of the dry cake mix. Pour melted butter evenly over the top of the cake mix. Bake 50 minutes. Let cool. 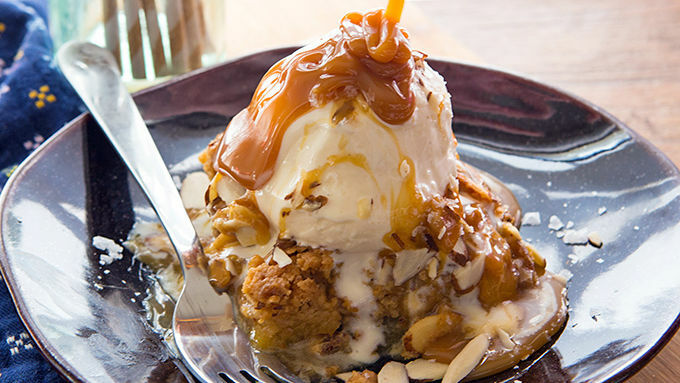 Top with ice cream and caramel sauce as desired. Peaches deserve this. So do you. 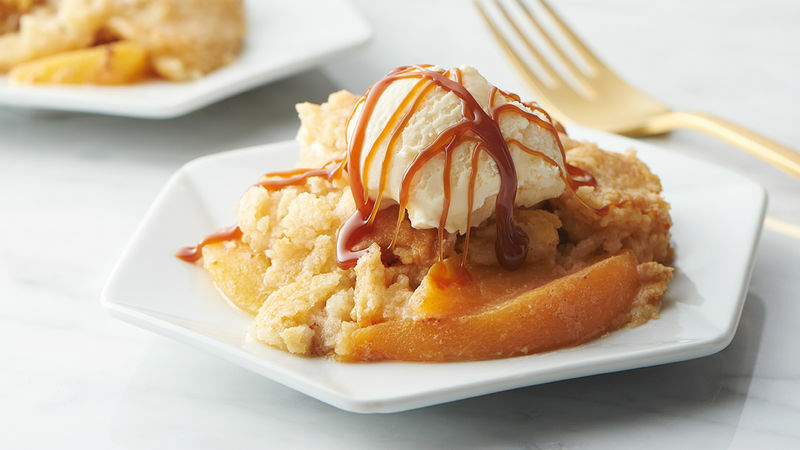 This Peach Dump Cake is an easy treat you can bring to a party or whip up for a simple, weeknight dessert. Dump cake is a delight. It’s absolutely delicious and so easy to make. And don’t think you have to wait for autumn (or baby showers) to have it in your kitchen. Whip up a spring-inspired Peach Dump Cake, using fresh peaches, then topped with a sweet white cake mix, and butter, and butter, and butter. Then baked until golden. 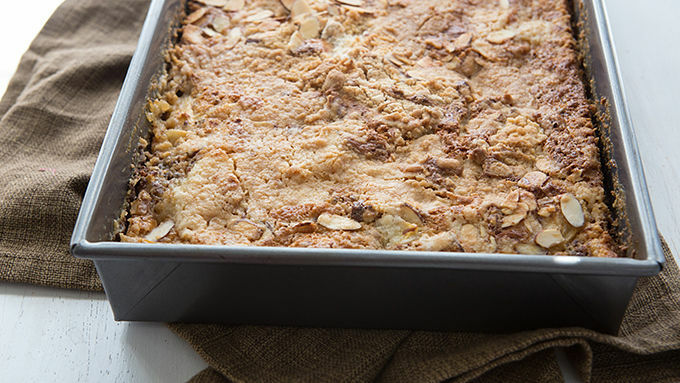 If you’ve never had dump cake, you simply must try it. If you have discovered it before this, you’ll know why this 16-serving recipe feeds only me for one whole week. Who needs dinner when you’ve got dump cake?! You can use fresh, ripe peaches or Cascadian Farms frozen ones will work too. The recipe isn’t finicky. It just needs pretty peaches. You can serve the cake hot and fresh out of the oven, but it doesn’t hold together very well. It will look like a mound of cobbler on your plate. Go for it if you’re okay with that style (it will still taste amazing). 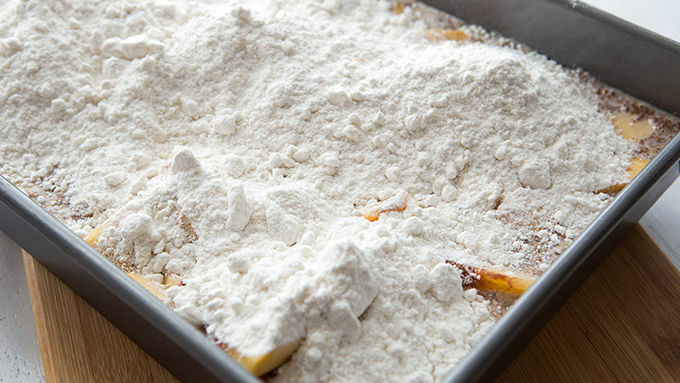 But if you want a pretty slice of Peach Dump Cake, allow the cake to cool before slicing into squares. Then top it with ice cream. And drizzle it with salted caramel. And top it with sliced almonds. Then grab a spoon. Because yummmmm.